It’s a terrifying fact that our kids learn more from watching us than anything we tell them. If you doubt this, just think of the last time you heard your own words come out of your child’s mouth. Even when we think they aren’t watching us, they are. And they are learning what is acceptable and what is not. And no matter how much we tell them otherwise, do-as-I-say-not-as-I-do just doesn’t work. When it comes to the digital world and the time our kids spend on screens and devices, we may think we are exempt. After all, they know much more about tech than we do, so they just ignore us when it comes to tech usage, right? They’ve written us off. In their minds, we are incapable of teaching them anything in that world. We are uniquely qualified to bring together the world of hard-won life experiences and the digital landscape that we, too, find ourselves navigating. While it is sometimes less annoying than having to type in your password every time, resist the temptation to just tell your child the passwords to your devices or accounts of any kind. Yes, it may be something harmless that they want to access. But it also sends an unintended message: It’s okay to share your passwords with people you like. I can’t tell you the number of stories I’ve heard of teens who’ve shared passwords with their BFFs or their boyfriend/girlfriend, only to have the relationship turn south weeks or months later. Many of the cases of cyber-bullying started from former “friends” who became enemies who now had access to the victim’s accounts. As much as you are comfortable, be transparent with your kids about your social media use. When you see a mean or inappropriate picture or comment, talk out loud about your decision to block that person or remove them. When you get a friend request from someone you don’t know, say something out loud if your kids are in the room. Ask them what they think you should do, and let it become a teachable moment. Openly share how you handle sticky situations (and positive ones!) when your kids are watching. Warning: The Militant Librarian is about to come out for a second. Our kids learn very quickly how easy it is to do a basic Google image search, right-click (which is the worst way to do this, by the way), and save or copy a picture. When that gets pasted somewhere public (even in a school project), they’ve violated copyright law almost every time. Whenever you can, show your kids how you use images. If your work requires you to do a presentation, ask them to help you find good images for the slides. This is a great opportunity to have this conversation and show them how to search for images that are acceptable. Image-hungry kids think nothing of aiming their smartphones at everyone and everything. I try to extend the same courtesy to others when I take their picture. If it’s someone I know, like the students in my school, I snap the shot and then tell them not to worry: I won’t be posting it. If it’s in a strange environment, I run the scenario through some obvious questions. Is the person doing something where they would expect to be photographed (playing a sport, performing on the street, wearing a crazy attention-grabbing costume at a Halloween party, etc.)? If not, and they are just minding their own business but their kids are doing something really cute, or their dog is adorbs, or they look startlingly like my cousin Frank, or they are wearing a t-shirt I really like and now want to buy, or you are at a restaurant and all the members of the family next to you are on smartphones and you want to snap a picture of how pathetic they look…just think first. But do this openly, so your kids can hear your thinking. “Wow, do you see that guy’s t-shirt? I should take a picture of that for your crazy aunt. I better ask him first, though.” Then demonstrate how whipping out a smartphone doesn’t have to become an awkward barrier between strangers. Instead, it can be a tool for striking up a conversation with a fellow human being. This is one I’ve been feeling guilty about lately. My boys are old enough to soon be starting social media accounts of their own. When they friend me (which they will be required to do), how many photos of themselves will they see? Will the images all be flattering, or will my children be embarrassed by the pictures I posted at their expense for my social gain. Harsh? Maybe. But we do two things when we ask their permission before posting their pictures. We model to them the right that each of us has to not have images of us posted online. We use this as a conversation starter about their own (current or future) online posts that include other people. It conveys: You should respectfully ask others if it’s okay the same way I’m now asking you. Put your phone or screen away when someone is speaking to you. It was one of my less-proud moments as a digital parent. I became frustrated by my son’s overuse of his device and his stalling when asked to put it away. In my irritation, I yelled something about needing to do something offline and then threatened to ground him from his screen for a few days. You probably don’t have to use too much imagination to picture what I was doing at the time. Yep. I was on my laptop. Literally, I was scolding him over my open laptop screen. Parent of the Year nomination lost, yet again. It is so critical, in an age of flat screens, to keep our connection with each other’s faces. I think one of the easiest ways to teach this is to establish the expectation (for everyone!) to put your laptop screen down or turn your phone or tablet over when you are speaking to someone. We’ve all had that annoyance of trying to chat with someone who can’t leave their screen alone for a few minutes to look at us. We can easily model this to our children whenever they approach us while we are on a device. Lately, having become more aware of this, I’ve tried to make an obvious show of tipping my screen down or setting my iPad face down when my children (or my spouse) ask me something. Oh, how easy it is to come home, exhausted mentally and physically from work, and just “veg” in front of a screen. Our parents would turn on the TV; we grab our tablet and launch some social media channel or YouTube. Guilty. But do our kids also see us relaxing in other ways? Maybe your kids are like ours, and it seems like the only way they can entertain themselves (and coincidentally, not kill each other) is by logging on. Did they learn that from us? Do we at least reinforce that by our own down-time choices? Confession time: I’m a school librarian (among other roles), and I’m ashamed of how little my kids see me reading. Yes, I “read” a lot. I have a 35-minute commute, and I “read” audiobooks on 2x speed. I read eBooks on my tablet because I can access them more quickly when I want to check them out. But my boys don’t see a physical book in my hands very often. The point here is not to argue the merits of physical books over eBooks. Nor is it to lament that my boys never read; they do, quite a bit. But what are they learning from my own actions and choices? Do they see me outside, hiking or working in the yard? Do they see me working with my hands on some project in the garage? Do they see us creating? It’s a stupid move even when our kids aren’t in the car because other people’s kids are in other cars with whom we are sharing the road. But when our kids are with us, it has a double impact. We are endangering their lives, and we are teaching them that it’s okay to look at your phone while driving. 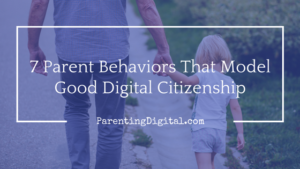 These behaviors are nothing too difficult. In some cases, they are what we already do. But I challenge you to do them more transparently. Do them out loud. Use these as teachable moments. 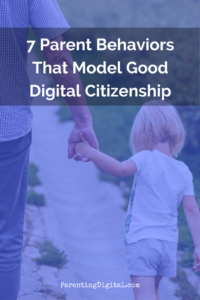 Be humble and honest, but be deliberate in the way to model good digital citizenship to your kids.